Provides radiance and smoothness of the roots to the ends. 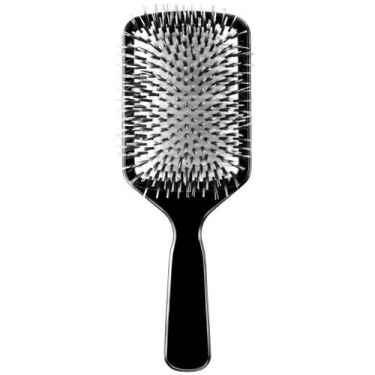 DESCRIPTION: Paddle Brush from Shu Uemura is a professional quality tool, hand crafted. This brush combines the flexibility of an air cushion with dual nylon and natural softened bristles for an efficient backing, enhanced shine and smoothness from the roots to the ends. Makeup, cosmetics and hair products. Shu Uemura was a renowned makeup artist of Tokyo that broke all the rules and codes in the creation of beauty. Shu Uemura's talent and art were discovered in 1955, while working as a makeup artist in the team of the Joe Butterfly film. After years of working with Hollywood stars, singers and personalities, including Frank Sinatra, Shu Uemura returned to Japan where he founded the Institute Shu Uemura Makeup. The Japanese artist has combined nature, science and art to create innovative makeup and revolutionary formulas to express all the beauty and creativity of the art of makeup. It was released in the production of skincare products based on the philosophy that a beautiful makeup begins with beautiful skin. Currently, the brand Shu Uemura follows the principles cited by its founder, extending to various fields: as hair, makeup and cosmetics. When he was young, Shu Uemura has suffered a serious illness that kept him from the stage and representation and then began his career in the art of makeup.